Here is the latest Associated Press Top 25 College Football Poll. Included is how I voted this week compared to the official one released Sunday afternoon. I took a lot more stock in USC beating previously No. 3 Utah than most of the other voters did. The Associated Press released its preseason top 25 college football poll Sunday. I was asked to be a voter this year, so throughout the season I will share my poll with you. I have been an AP poll voter in the past, but prior to the College Football Playoff I voted in the Harris Poll, which was a part of the Bowl Championship Series process. Here are news and notes from all 12 Mountain West football team compiled by the beat writers who cover each squad. Look for this feature every Tuesday on this blog, and at wyosports.net. For the second consecutive week, Air Force will be breaking in a first-time starter at quarterback. Kale Pearson injured the anterior cruciate ligament in his right knee just two quarters into his starting debut in a 38-13 victory over Colgate and likely will miss “a while,” according to coach Troy Calhoun. 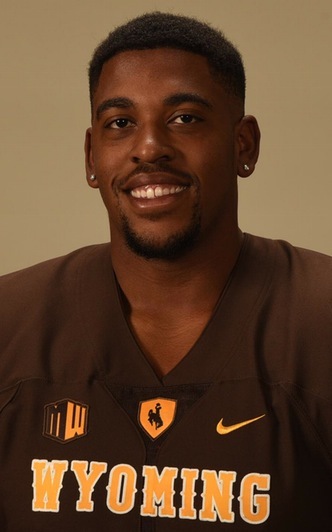 The Falcons will turn to sophomore Jaleel Awini, a native of nearby Aurora, Colo., who had battled Pearson for the position through the spring and fall. Awini threw just three times against Colgate, completing two passes for 26 yards. He lost 18 yards on a sack, leading to a line of minus-3 yards rushing. At 6-foot-2, 210 pounds, the strong-armed Awini is significantly taller than Pearson. Sophomore Karson Roberts slides into the backup spot behind Awini. Notable: Aside from Pearson, Air Force emerged from the opener without a significant injury. … This week’s opposing quarterback, Utah State’s Chuckie Keeton, decommitted after initially deciding to attend Air Force. … The Falcons trailed Colgate 7-0 after the first quarter before scoring 38 straight points. Wyoming graduate assistant football coaches Weston Johnson (handing the ball off) and Renaldo Hill work with kids during a one-day camp for youth in kindergarten through 12th grade Wednesday at McCormick Junior High in Cheyenne.